Great looks and proven reliability: The Travel'r incorporates design features used on Carefree's popular 12V Eclipse at an economical price. It features integrated styling and mounts flush to the RV. 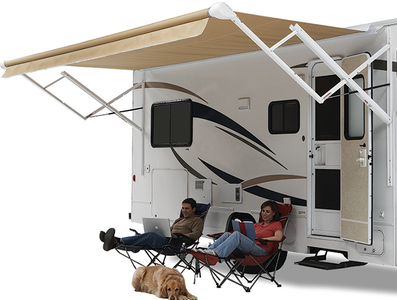 Buy the Travel'r as a complete new awning or upgrade your current manual Carefree or Dometic/A&E patio awning to push-button operation. Just switch out the arm set. 8' Extension hardwired (Includes wall switch). Adjustable Pitch model: Ideal when you want the instant pitch adjustment not found on the steep pitch model. Requires a flat mounting area of 67" x 3.5" from awning rail down.